SCCM 1802 slow ring is released for all the environments which are on 1702 or later. 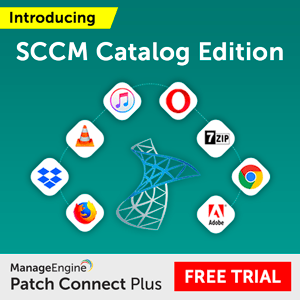 The latest version of SCCM CB update should be available for all applicable environments. More details about the production version 1802 upgrade is explained in the video tutorial. SCCM CB prerequisite checks are very important to reduce the upgrade failures in the production environment. I have listed down all the prerequisite checks included in the SCCM CB 1803 technical preview version. The SCCM CB prerequisite checks are noted down from the primary server. The sequence of prerequisite checks is traced from ConfigMgrPrereq.log file. 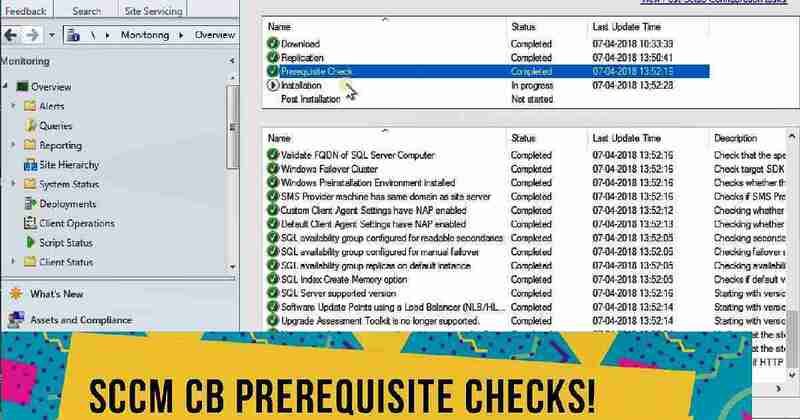 All the following SCCM CB prerequisite checks (rules) are not applicable in all scenarios. Following are some of the examples which I found in ConfigMgrPrereq.log file. I think some Prerequisite checks which are required for CAS server is not required for the primary server. 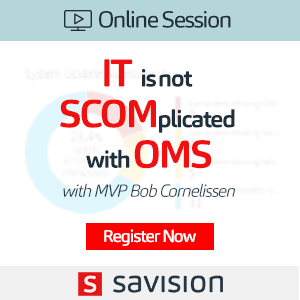 The Same logic is applicable some scenarios like in-console update (updates & servicing – Easysetup), and fresh SCCM install. Prerequisite rule 'SQL availability group replicas on default instance' will run for easysetup upgrade. The rule 'SQL availability group replicas on default instance' has been run on server 'SCCMTP1.Intune.com', skipped. 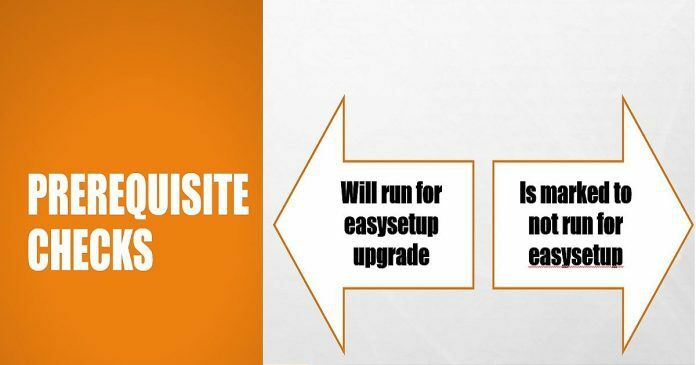 Prerequisite rule 'Unsupported site system role 'Asset Intelligence synchronization point' for the LTSB edition' is marked to not run for easysetup. Prerequisite rule 'Unsupported feature 'Cloud Distribution point' for the LTSB edition' is marked to not run for easysetup. The prerequisite checks cover CAS, Primary servers, and remote site systems servers. It also includes SQL version, Collation settings, and Replication link verification. 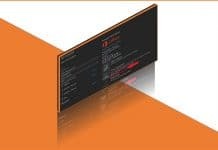 SCCM prerequisite checks consist of unsupported configurations (NAP, System Health Validation Point) and SCCM LTSB configuration with SCCM environment. SCCM CB primary server Rule Categories are listed down. These are the categories which I cracked down from ConfigMgrPrereq.log. However, Microsoft SCCM team will include new prerequisite checks with every new release of SCCM CB. SCCM CB prerequisite checks are repeated for different site systems & servers before the start of the SCCM CB upgrade. This could vary depending upon your SCCM CB infra. I have completed prerequisite checks for SCCM CB 1803 TP environment. All the required prerequisite checks are completed successfully. Verifies that the logged on user account has administrative rights on the site system computer. Verifies that the user running Setup has local administrator rights on the central administration site server. Checks if the user account running Setup has sysadmin rights on the SQL Server for the CAS. Check Server Service (LanmanServer) is running. Verifies that the computer specified for installation is a member of a Windows domain. Verify that the Active Directory domain functional level is Windows Server 2003 or later. Checks that the site server computer has sufficient available disk space to install the site server. Checks if a system restart is pending. Checking unsupported Read-Only Domain Controller on site server. Checking Site Server FQDN Length. Verifies that the Microsoft Core XML Services (MSXML) version 6.0 or later libraries are installed. Determines if the Windows Server 2003-based schannel hotfix is installed on the site server. Verifies that the Microsoft Remote Differential Compression (RDC) library is registered on the computer specified for Configuration Manager site server installation. Checking Windows Installer Version >= 4.5. Checks if the target site server computer already has existing Configuration Manager server components installed. Checks if the Windows Firewall is disabled or if a relevant Windows Firewall exception exists for SQL Server. Check SQL Server service running account. Verifies that the site server's database collation matches the database collation of its parent site. Verifies that the Microsoft .NET Framework version 3.5 is installed on Configuration Manager central administration site servers, primary site servers, and secondary site servers. 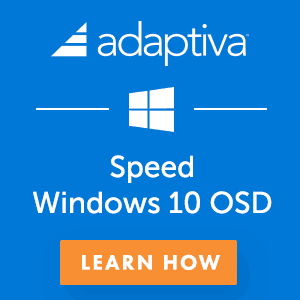 Checks whether the Windows Deployment Tools component of Windows Assessment and Deployment Kit (ADK) for Windows 10 is installed. Checks whether the User State Migration Tool (USMT) component of Windows Assessment and Deployment Kit (ADK) for Windows 10 is installed. Checks if the FQDN provided for the site system uses the primary DNS hostname for the computer. Checks if the specified site code is already in use by another site in your hierarchy. Check the parent Central Administration Site has the same version. Verifies that the SQL Server instance and Configuration Manager site database (if present) are configured to use a supported collation. Verifies that the site server is processing critical inboxes in a timely fashion, and that inboxes do not contain files older than one day. 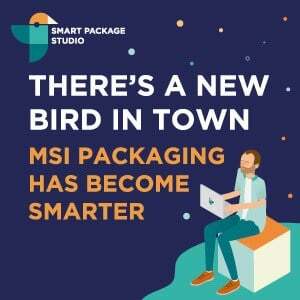 Verifies that all distribution points in the site have the latest version of software distribution packages. Verifies that SUM is not using any virtual locations for active SUPs. Verifies that no active source hierarchy is currently configured for migration. Verifies that all site servers in the hierarchy meet the Configuration Manager minimum version that is required for upgrade. Verifies that the replication status of the parent site is Replication Active (corresponds to status=125). Checking that the site system role 'Out of band service point' is not deployed. Checking whether the site system role 'System Health Validator' exists in the hierarchy. 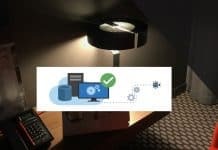 Verifies that the user account running Configuration Manager Setup has been granted sysadmin SQL Server role permissions on the SQL Server instance selected for site database installation. SQL Server sysadmin role permissions are required in order to create the site database and configure necessary database role and login permissions for Configuration Manager sites. Verifies that the user account running Configuration Manager Setup has been granted sysadmin SQL Server role permissions on the SQL Server instance selected for reference site database installation. SQL Server sysadmin role permissions are required in order to modify the site database. Verifies that the site server computer account has administrative rights on the SQL Server and management point. Verifies that the version of Microsoft SQL Server installed on the computer selected to host the site database meets the minimum requirements. Checking the site SQL Server is not Express Edition. Checking the site SQL Server Tcp is enabled and set to Static port. Checks if the SQL Server hosting the Configuration Manager site database is using a case-insensitive collation. Check that the specified FQDN for the SQL Server computer is valid. Check target SDK machine is not Windows Cluster Node. Checks whether the Windows Preinstallation Environment component of Windows Assessment and Deployment Kit (ADK) for Windows 10 is installed. Checks if SMS Provider machine has same domain as site server. Starting with version 1702, Configuration Manager does not support SQL Server 2008 R2. Starting with version 1702, Configuration Manager does not support Software Update Points on Loadbalancers (NLB/HLB). 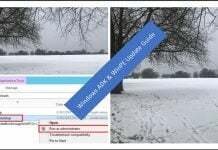 Starting with version 1706, Upgrade Assessment Toolkit is no longer supported. Verifies that the site system to be upgraded meets the minimum operating system requirement for site system installation. I am facing an upgrade problem in my network, same problem with upgrading to 1802 from 1710 as upgrading to 1710 Hotfix Rollup (KB4086143) from 1710. The Prerequisite check is passed fine and all the upgrades is STATUS windows shows green till the “Install Files” section where it fails. At last I did a change control today and restarted my Windows 2016 server (my SCCM Primary Site Server) and disabled the Defender (Real Time Protection) in it. Then tried the 1802 upgrade. But it failed again. No difference. Same thing – getting stuck at “Install Files” section. Thanks and your help much appreciated. What is the error that you are getting now? >>INFO: Failed to check if file \\?\e:\program files\microsoft configuration manager\osd\bin\x64\ccmcore.dll exists (LastError=0x80070005). No zapping is done. >>INFO: Failed to zap the file \\?\e:\program files\microsoft configuration manager\osd\bin\x64\ccmcore.dll (LastError=0). will try to copy file again. Looks like my Server 2016 ccmcore.dll file might have a problem. I tried to unregister and register it but did not work that good so far. Were you able to overcome the failed upgrade to 1802? If so, what was the issue and how did you resolve it? Do you have checlist for Migrating from SCCM 2012 R2 to 1802. I am trying to upgrade to 1802 from 1702. Prerequisites check is failing for no active replica mp found. we need to remove replica MP ….